Taverns come in all shapes and sizes from seedy dockside taverns, to welcoming traveller’s rests and opulent establishments catering to the rich and powerful. Taverns are incredibly important locations in most campaigns. When a band of adventurers enters a new village, town or city they are virtually certain to visit a tavern (or two). Home Away From Home: Most adventurers don’t maintain a home base. While they might have a home where their parents live, I doubt many mighty warriors or powerful wizards live with their mummy and daddy. Sadly, an adventurer’s lifestyle means he is often on the move. This inevitably means he’ll need somewhere to stay and taverns fit the bill very nicely. Get Jobs: It’s one of the terrible cliches of fantasy gaming, but often adventurers meet their prospective employer in a tavern. In many cases, they have answered a specific summons or their prospective employer has just been hanging around waiting for adventurers to show up. Beyond these (lacklustre) job opportunities taverns are a great place for adventurers to suffer from mistaken identity, theft, assault and other events leading to their next adventure! Get Information: Taverns are often the social hub of a community or settlement. As such, they are busy places in which people meet and exchange news. Inevitably, this means the crowd is rife with rumours of both events great and small. Adventurers looking to get the latest news can do far worse than buying a few rounds of drinks at a local tavern. Hire Help: Sometimes, an adventurer may need help on his next adventure. Perhaps he requires a few guards to watch over him while he sleeps or he hopes to recover so much treasure he needs to hire a porter or two! Taverns are also a good place to meet prospective henchmen as adventurous types often lurk in such locations for the above reasons. Have a Brawl: Barroom brawls are fun (add one to your campaign today)! They are a great way for the players to let their hair down and roll some dice without the imminent threat of a PC dying. Do you find taverns useful for another reason? Do the taverns in your campaign fulfil another role? 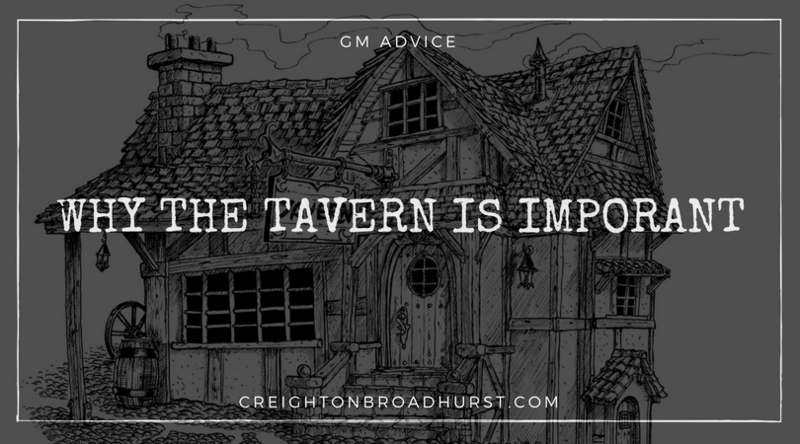 Let us know in the comments below and help GMs make better use of the taverns in their campaign today! All good points, but I also think Taverns can add to the tone and setting of a game, giving a level of details and ‘feel’ to things that might not come across in other circumstances. They can add opportunities for role play and character development. I once had a poor road side tavern that was gutted by a nest of young dragons and the players dealt with the restless dead that were left behind, as well as tracking down the dangerous beasts that were using the area as a hunting ground. The tavern section was a bit creepy (a family of ghosts can be unnerving). A pauper’s tavern on the edge of a woodland had the reputation of having a dangerous stew pot – the only food you could get was the stew, and you wanted to get the stew from the top of the pot, not the stuff on the bottom. Some said the stuff on the bottom had been there for weeks, if not months. The tavern keep “Old Mother” also had the reputation of killing people she didn’t like with poisons … and yet … the party still ate there … keeping an eye on everything and everyone. A lot of role play interaction can occur in the tavern and you can get a strong sense of the people and the politics (the Information in your list above), there’s also the occasional game of dice or cards, the opportunity for a Bard to make some tips and the party Rogue can check a few pockets. It’s also a good opportunity for the players to stretch their ‘role playing’ muscle a bit by getting into character in a way that doesn’t always happen during combat. Taverns are also a great place for players to learn about the history of a settlement. Having some veterans or seniors hanging around, it’s a great way to provide some background info. And I love private “on invitation only” rooms in a tavern, where the local backstage diplomacy can happen. Players may feel excited about getting invited. I have never understood the vitriol some gamers have towards taverns. I use them all the time. Taverns? Definitely home away from home, sometimes even home, if the characters book a room (or rooms) long-term. Sometimes I have used a tavern/inn as the entire setting for a short one-shot, or even as part of an ongoing campaign. What’s going on there? WHY is it gong on there? I love the idea of setting an entire adventure in a tavern! I may steal that; thank you, Martin!